Funseek is a promotional platform for local events and businesses featuring millions of events and venues across the United States. Our challenge was to provide a turnkey web solution starting from requirements engineering, design and development to technical support and hosting. The main distinguishing feature of the project is User Interface which is exceptionally bright, attractive, and recognizable to hold Funseek visitors’ attention. The UI looks perfect on various screen sizes including mobile devices and high-resolution displays. The landing page starts with a colorful animated fortune teller created using HTML5 technology. Its design was deliberately simplified while the complex processes are carried out in the application back-end. High-contrast color schemes and sticky menu behaviors allow users with disabilities to enjoy Funseek. Technically Funseek was implemented in milestones using PHP framework – Symphony 2.0 and MySQL database on the server side and HTML5/CSS3/jQuery on the client side. The event heavy-loaded database is populated with numerous data sources including events added by users, automated website parsers, XML feeds and partner APIs. Funseek search functions are simple, user-friendly and powerful all at the same time, search results can be filtered by venue, location, categories, dates and keywords. Funseek includes integration with external APIs allowing users to search events nationwide. User location is defined automatically with the help of IP geolocation. It facilitates finding the best entertainment in the local area. Users also benefit from integrated Google Maps and granular search system as they can filter events by venue. Using Facebook login, we implemented unified authorization for both Funseek and Fundo users. Fundo blog was created as an additional feature to highlight the most interesting upcoming events. It is built using WordPress and allows our Client to manage and add new articles. 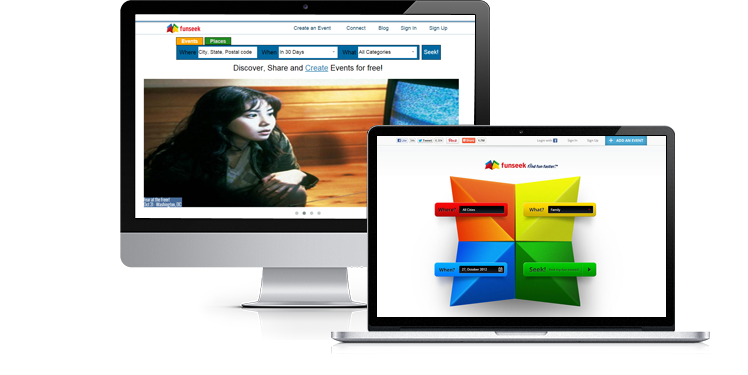 At the same time, Funseek became more interactive with a functionality to share events in Facebook, Twitter, Google+ or via e-mail.